The 'registered' for delivery silver bullion at the Comex licensed facilities dropped by 7,792,110 troy ounces yesterday. This takes the total from 36,322,409 to 28,530,299. This is a one day decline of 21.5%. This also brings the total deliverable silver down to some unfamiliar lows not seen since 2011. The level is not nearly as extreme as gold's, but it is getting there if this keeps up. 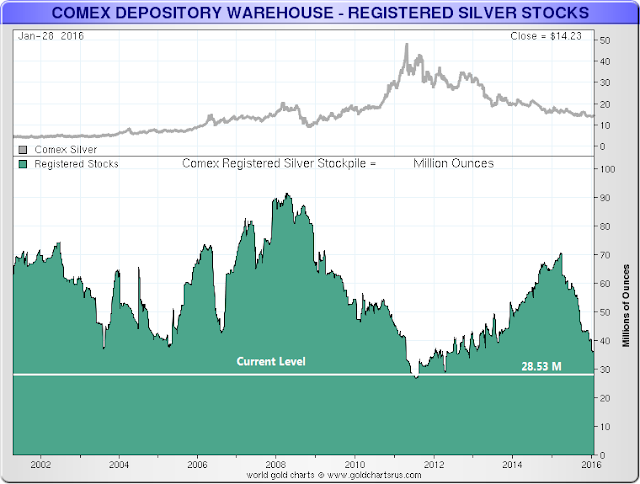 I include a chart of the registered silver at Comex for the last ten years below. Silver in these warehouses has been seeing some large movements for some time now, a fact which I attributed to CNT using the Comex as a delivery mechanism for the silver which they use in their wholesale business. But this kind of drop is not usual. Comex Silver looks positively lively compared to Comex Gold, which is starting to resemble a Madame Tussaud's depiction of a commodity market, seeing very little activity, and almost frozen in time like some artifact from the past. I bring these facts to your attention not out of some sense of alarm, and I do not wish to sensationalize them. Although some do. I think it is just something a bit unusual that bears watching, since it does not seem to be occurring in isolation and is an 'outlier' from the usual business. And I would not have brought it up except in passing if it had only related to CNT, which I would have then assumed was related to one of their large wholesale transactions. Below is the statement of the warehouses from the day before, from last night's posting here.